On the other hand, ignorance of or inexperience with an expression in material you’re reading can trigger an excavation into memory that might pull up all sorts of things. 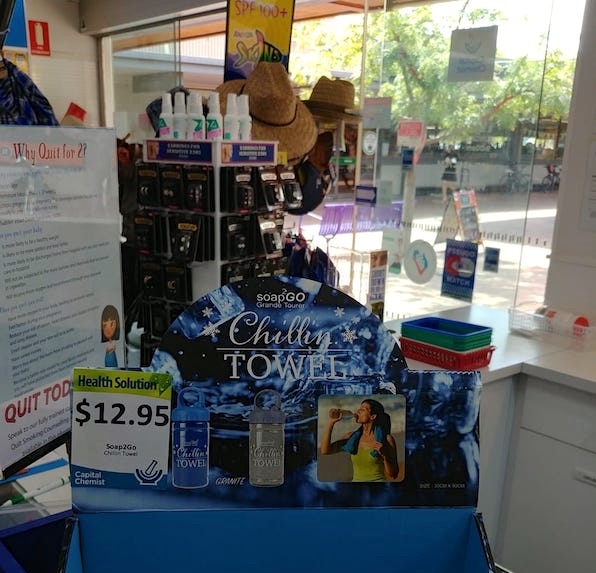 I myself, unaware that there was something called a Chillin Towel and having at first no idea what one might be, initially read the expression as Chillun Towel ‘a towel for (US Southern or Black) children’. Kind of silly, but explicable. And then I thought of linguist Chilin Shih at UIUC, though what she might have to do with towels I couldn’t imagine (I did manage to read Towel correctly (while Avery slipped into Towers, for some reason). Turns out Chillin Towels are an Australian thing; Avery, though born in Pennsylvania and educated in the US, is now an Australian, and might well know about Chillin Towels, but even so, he misread the sign. Meanwhile, he obviously knows about Cthuhu. The Chillin Towel is a chemical-free cooling towel that comes in [its] own easy carry bottle with a convenient clip right on the top. … Activating the towel is easy – just wet it, squeeze out the excess moisture and whip or wave the towel to circulate air-flow. The cutting edge towel will keep cool for hours at a time once wet. To re-activate, all you’ve got to do is wet and whip or wave the towel to provide air-circulation and enjoy the cooling effect! Cthulhu … is a fictional cosmic entity created by writer H. P. Lovecraft and first introduced in the short story “The Call of Cthulhu”, published in the American pulp magazine Weird Tales in 1928. 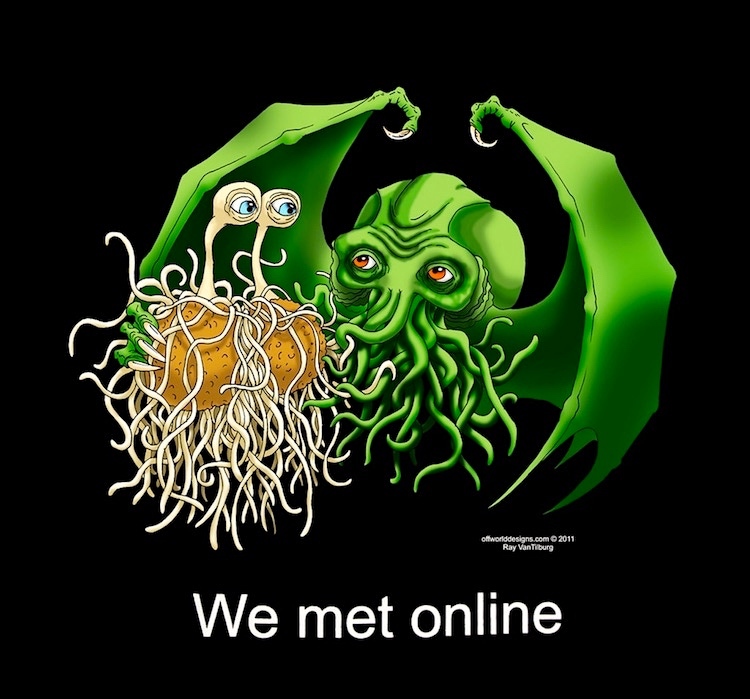 Considered a Great Old One within the pantheon of Lovecraftian cosmic entities, the creature has since been featured in numerous popular culture references. Lovecraft depicts Cthulhu as a gigantic entity worshipped by cultists. Cthulhu’s appearance is described as looking like an octopus, a dragon, and a caricature of human form. Its name was given to the Lovecraft-inspired universe where it and its fellow entities existed, the Cthulhu Mythos. Though invented by Lovecraft in 1928, the name Cthulhu is probably derived from the word chthonic, derived from Classical Greek, meaning “subterranean”, as apparently suggested by Lovecraft himself at the end of his 1923 tale “The Rats in the Walls”. 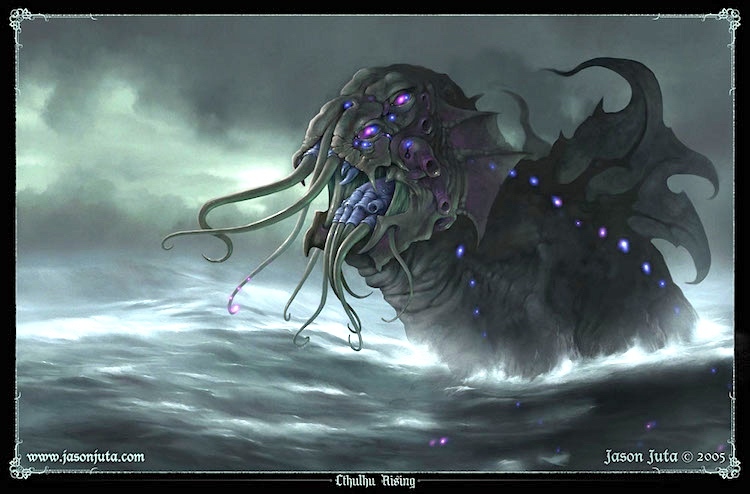 … In “The Call of Cthulhu”, H. P. Lovecraft describes a statue of Cthulhu as “A monster of vaguely anthropoid outline, but with an octopus-like head whose face was a mass of feelers, a scaly, rubbery-looking body, prodigious claws on hind and fore feet, and long, narrow wings behind.” Cthulhu has been described in appearance as resembling an octopus, a dragon and a human caricature, hundreds of meters tall, with webbed human-looking arms and legs and a pair of rudimentary wings on its back. Cthulhu’s head is depicted as similar to the entirety of a gigantic octopus, with an unknown number of tentacles surrounding its supposed mouth. This entry was posted on February 26, 2019 at 12:02 pm and is filed under Books, Context, Fiction, Linguistics in the comics, Memory, Misreadings, Pragmatics, Processing. You can follow any responses to this entry through the RSS 2.0 feed. You can leave a response, or trackback from your own site.